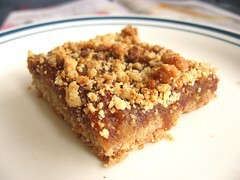 Apple Date-Nut Bars - Do You Know The Muffin Man? Notes: The simmering apple and date mixture needs attention, so you may want to add a bit of water from time to time to prevent it from scorching. I only made half of the flour mixture and used it for the bottom, patting it firmly into the pan as suggested by one of the reviewers. For the topping, I used some leftover crumble mixture I had in the freezer. These were absolutely delicious: the filling is more interesting and less sweet than traditional date squares. Highly recommended.